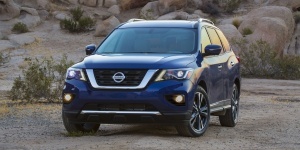 For 2018, the Nissan Pathfinder features standard Automatic Emergency Braking (AEB) and a Rear Door Alert system. Previously only available on the Platinum trim, the Midnight Edition package is now available on SL trims. Get the best price for the Nissan Pathfinder of your choice from a dealer in your area. Request a price quote now.